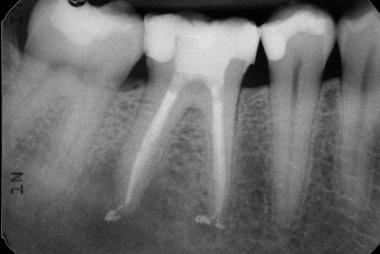 The root canal procedure (also known as endodontics) is one that has gained a certain negative reputation over the years. The reality though is that modern dentistry and the use of x-rays and anaesthetic now means that the patient should not experience any significant pain during this procedure. The treatment itself is, in fact, a highly useful method that is used to save a badly infected tooth and prevent the need for its extraction. The procedure is performed when the inner soft part of the tooth, where the nerves and tiny blood vessels are stored, becomes infected. We may need to refer you over to our sister practice in Chelmsford for your treatment. 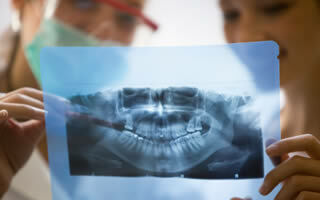 Prior to the procedure itself, x-rays will be taken to check for any sign of a dental abscess within the tooth. If an abscess is discovered, the procedure will be postponed and the abscess treated with antibiotics. Once the tooth is free of any abscesses, the dentist at Foxhall Dental Surgery will then apply a local anaesthetic, numbing the area of the procedure to minimise any discomfort which may be felt. Once the anesthetic has taken effect, the top of the tooth is removed, exposing the soft inner part. The majority of this soft pulp is then removed using a suction tool. The inner core of the now hollow tooth is then cleaned with special dental files and an antibiotic solution applied to rid it of any remnants of the bacterial infection. With the tooth now fully prepared, a special filling is used to fill the hollow tooth and, finally, a crown is added to the top of the tooth to give it additional strength and also to improve its aesthetic appearance. Although a tooth that has had a root canal procedure does not require any special care, there are a few factors which the patient should consider. Firstly, it should be noted that, although the tooth is now in effect dead and has no sensation due to the removal of the nerves, the enamel itself is still prone to decay if not cleaned. To this end, a normal teeth cleaning routine, with the teeth brushed at least twice a day for two minutes each time, should be carried out to include this tooth. Flossing, along with the cleaning of the teeth, is important too as gum disease is still a real possibility in the gums surrounding the treated tooth. If neglected, this can become serious and gingivitis and ultimately periodontitis may put the whole tooth at risk. Finally, a word about the strength of the treated tooth. Although a tooth that has been root treated and a crown attached will be more than adequate for most chewing tasks; it is not quite as strong as a healthy tooth and therefore, biting down on hard objects should be avoided as much as possible to ensure its longevity.